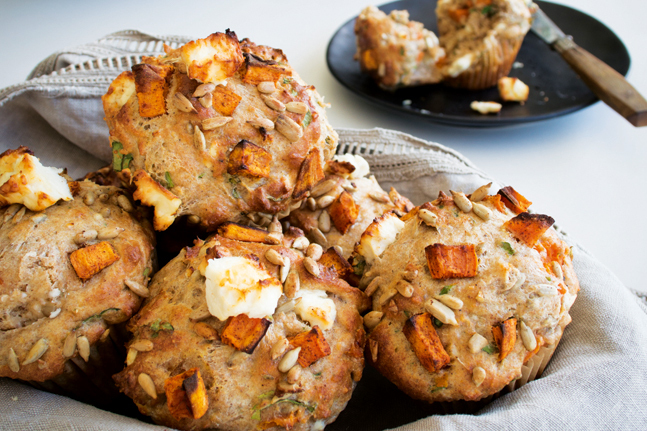 A wholesome one-handed snack, these delicious savoury muffins are perfect for a picnic. You can either make them ahead or bake them fresh. They are both nourishing and filling. On small baking tray lined with baking paper, place sweet potato and sunflower seeds. Add maple syrup, olive oil, cinnamon and sea salt and toss together. Arrange in single layer and bake for 15 mins. In food processor or large bowl, place parmesan and thyme leaves and mix to combine. Add eggs and milk and beat for 10 secs until well combined and frothy. Add baking powder, sea salt and pepper and mix until just combined. Fold in flour until almost combined (it’s important not to over-mix or they will be heavy). Add spinach, feta and baked sweet potato and sunflower seeds. Gently fold into batter. Divide between 8 non-stick muffin cases and bake for 15 mins or until skewer inserted into middle comes out clean. Enjoy warm or at room temperature slathered in butter. Tip: for gluten-free, substitute the spelt with good-quality gluten-free flour. Georgia Harding is a naturopath with almost 20 years experience, a mother and a passionate health educator. After many years consulting in a busy practice, lecturing in natural medicine and sharing her knowledge on talkback radio, Georgia decided to reach out and share her passion for holistic health by developing her blog, Well Nourished. On her website, she shares fad-free health advice and intolerance/allergy-friendly recipes to inspire people to live happy, healthy lives and create delicious food memories. Georgia’s ebook Rise and Shine: A Well Nourished Breakfast will inspire and guide you to prepare the most important meal of the day in just minutes. Her latest ebook The Well Nourished Lunch Box contains over 50 nut-free, allergy-friendly wholefood sweet and savoury snacks, lunches and meals to inspire you to pack a nourishing lunch box that your kids will love to eat and you will love to make.